Cossacks 3 game on the beaten track. GSC Game World Ukrainian studio, loudly declared about themselves projects STALKER and Cossacks, after the collapse again gathered to work on a new project. 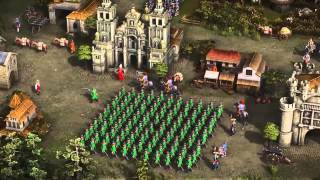 In May 2015, the Cossacks 3 game in the RTS genre was being developed at full speed, and the first screenshots were shown, accompanied by the announcement of the gameplay features. But if at the beginning the expected launch date of the product was the end of 2015, it is now clear that a more realistic point for Cossacks 3 download can be considered the year 2016. In essence, the third part is a remake of the first series that has become popular, but with significant improvements and additions, as well as in 3D graphics. Events are developing again at the turn of the XVII-XVIII centuries, and players will be able to build bases, hire troops, engage in exploration of territories, and extract resources. The map can converge at the same time up to 10,000 units, tasks differ depending on the tasks set and the selected game regulations. In multiplayer mode on the map can roam up to 7 gamers, teaming up and fighting against bots. Fans can not wait to be able to download Cossacks 3, and the developers continue to work on improvements and additions. It is known that, in addition to the main company staff, other specialists from Ukraine and Russia are involved in the work, some of whom work remotely. Site GSC Game World after a long inactivity again earned, but the information on the Cossacks 3 on the PC on it is not so much. It is known that in addition to Windows, versions for Linux and OS X platforms will be available, which expands the number of players willing to buy Cossacks 3. And judging by the stated features of the updated gaming space, the new version will enjoy even greater success than the classic Cossacks of 2001. If you consider that Cossacks 3 will continue to develop even after the release, gamers will have a lot of interesting new products. Already, the potential of the renewed toy is felt, and the screenshots and the videos presented earlier spur a desire to quickly begin the journey through the beautiful lands and test themselves in the missions. Waiting is always painful. But let the fans, who anticipated the fourth quarter of the outgoing year, with the hope that they will soon be able to enjoy the three-dimensional landscapes and its development, did not get what they wanted in time, it is better to wait a little longer, but to get a quality product without rough edges and deficiencies.